Rainbow Bridge isn’t a rainbow, but it is pretty neat. Water flowing from the mountains to the Colorado River eroded sandstone over millions of years. The water caused a bridge or arch of sandstone to form. This natural bridge is almost 300 feet high and 270 feet wide. The Navajo (Reads like: Navaho) people believe Rainbow Bridge is a sacred place. They see the bridge as proof of the gods who send rain, rainbows and clouds. In the hot desert, rain is a valuable thing. 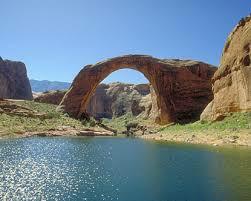 All about Rainbow Bridge, the natural bridge in southern Utah near Lake Powell. This is almost 300 feet high and 270 feet wide. Rainbow Bridge is in southern Utah near Lake Powell. It can be reached by boat, horseback or on foot. You can take a boat tour from the Bullfrog or Wahweap marinas. Rainbow Bridge is very hot in the summer. The average daily temperature is 100 degrees Fahrenheit (37.8 degrees Celsius). The best times to visit Rainbow Bridge are in the spring and fall. Rainbow Bridge is reddish brown. Many cat owners like to imagine Rainbow Bridge is a place their dead cats go to, like our Heaven or Garden of Eden. The Navajo people believe Rainbow Bridge is a sacred place. They see the bridge as proof of the gods who send rain, rainbows and clouds. A video about a trip to the Rainbow Bridge. 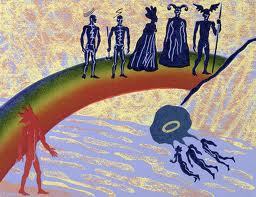 Question: Do people live near Rainbow Bridge? Answer: The American Navajo Indians still live nearby. Enjoyed the Easy Science for Kids Website all about Rainbow Bridge info? Take the FREE & fun Rainbow Bridge quiz and download FREE Rainbow Bridge worksheet for kids. For lengthy info click here. Declan, Tobin. " Rainbow Bridge Facts for Kids ." Easy Science for Kids, Apr 2019. Web. 26 Apr 2019. < https://easyscienceforkids.com/all-about-rainbow-bridge/ >.